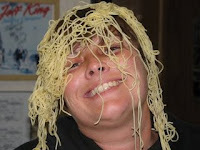 Have three guys give three girls (or vice versa) a "haircut" by dumping spaghetti on their heads. Give them scissors (child safe work great) and a comb and let them create a hairdo. You may use chefs uniforms or Italian hair experts to sell the game. Have background music (Italian, etc. ).